The Super Bowl is right around the corner and millions of Americans are making winning game day plans packed with quintessential football fare. Keep it simple and look for chips with short ingredient lists. Stay clear of flavored chips like barbecue, cheddar or lime. Watch the sodium: Aim for less than 80 mg per serving in corn chips or less than 120 mg per serving in potato chips. Salsa can be a great healthy dip if you know how to spot a few penalties. As with chips, you want to steer clear of salsa with a lot of salt. There is tasty salsa with NO added salt. And don’t get blindsided by another sneaky offender – sugar. Sugar is often snuck into salsa to improve taste. Seeing “cane sugar” or the like on the label is a good reason to look elsewhere. Hold the line on sodium: look for 120 mg or less per serving. Avoid added sugars, such as evaporated cane juice, fruit juice concentrates, agave, honey, molasses, sugars, syrups, dextrose, glucose, sucrose or fructose. If you’re ordering food for the final play of the game, you may consume potentially hazardous PFCs. A new EWG report revealed that these sneaky chemicals are commonly used in food wrappers, so watch out for those grease-resistant papers commonly found in wings containers, wrapped around burritos or tucked under pizzas. Whenever possible, eat fresh foods and prepare meals at home to avoid the potential health risks of PFCs. Who doesn’t want to enjoy a cheesy slice of pizza halfway through the big game? But we all also want to limit heart pounding to game-day excitement. Pizza is the second-highest source of artery-clogging solid fats in the American diet, and the third-highest source of blood pressure-raising sodium. With a good game plan, though, you can eat a slice that’s easier on your heart. Make your own pizza if you can. As guests arrive, break the ice by inviting them to add toppings their own pizzas. Then pop them into the oven at kickoff and dance in the end zone when your home is filled with the smell of sizzling, fresh, personalized pizzas. Here’s a fun, fumble-free recipe. Serve it alongside a crunchy seasonal salad to help guests eat more vegetables. Avoid food additives such as sodium nitrite, BHA or BHT. Steer clear of partially hydrogenated vegetable oils. Do your best with sodium: 750 mg or less per serving is a realistic goal for this special occasion. Don’t forget to make sure the whole team is hydrating throughout the game – but skip the sugary sodas and opt for filtered tap water instead. 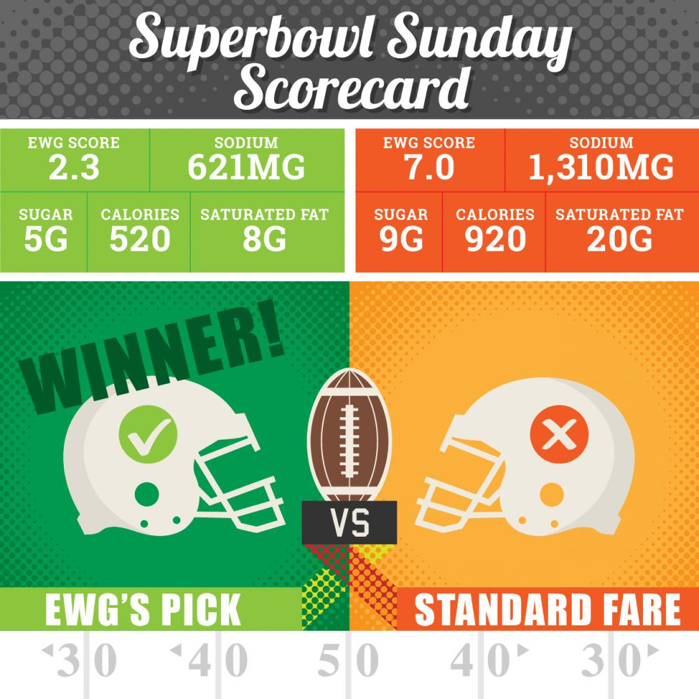 No matter who you’re cheering for this Super Bowl Sunday, everyone wins when you serve healthier options that still satisfy all the fans at your gathering. Whatever you’re looking for, EWG can help you find a better option in the store with our Healthy Living app. See how all of your favorite foods match up by searching in EWG’s Food Scores.